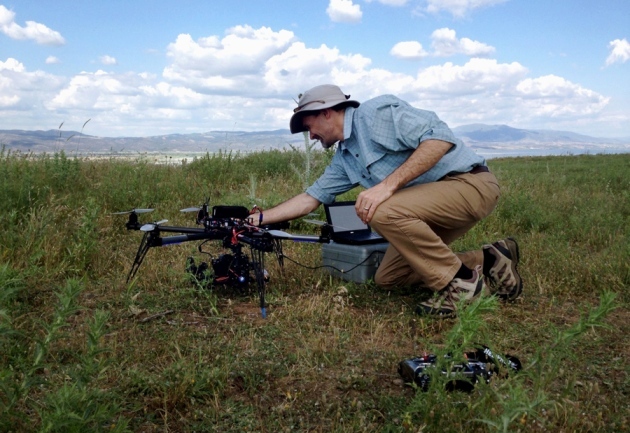 Over the past few months, archaeologist Chris Roosevelt has been remotely piloting a petite six-rotor helicopter named Hydra over western Turkey, snapping high-resolution photographs of the scrubby terrain. The pictures will be assembled into three-dimensional maps to help Roosevelt and his colleagues to understand how people who built a kingdom in the region 3,500 years ago interacted with the landscape. But back home at Boston University in Massachusetts, he is not allowed to fly the copter — not even to teach budding archaeologists on campus how to use it. On 23 June, the US Federal Aviation Administration (FAA) told drone users that such aircraft cannot be flown for ‘commercial’ use — defined as any activity that is not recreational or part of a government programme. That includes research and teaching at private, but not public, universities. Even though the announcement merely clarified existing rules, it caught many by surprise and reinforced a seemingly arbitrary dichotomy that treats researchers differently on the basis of their institutional affiliation. Drones’ small size, low cost and long-lasting batteries have made them popular in research and business. Scientists deploy the machines to study everything from atmospheric science to zoology, and companies are eager to harness them for aerial photography and package delivery. This has put the FAA under pressure to develop regulations prohibiting uses of drones that compromise safety or violate privacy. A few years ago, the US Congress ordered the FAA to develop such rules by September 2015. But in a report this July, the US Department of Transportation’s inspector general expressed doubt that the FAA would make its deadline.